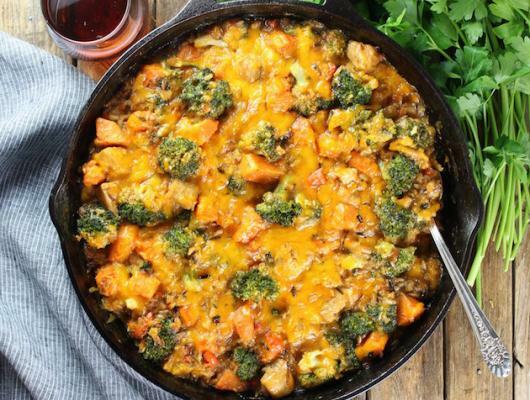 Heat one tablespoon olive oil over medium-high heat in a large (12-inch) oven-proof skillet. Add onion and carrot, then saute for 3 minutes. Add chicken, salt, and pepper, and continue cooking over high heat for 5 minutes. Add minced garlic and cook for one more minute. Add Progresso Reduced Sodium Savory Chicken & Wild Rice Soup, chicken stock and bring to a simmer. Add wild rice, cover, and cook for 25 minutes. Stir in broccoli, cover and cook another 4 minutes. Remove cover and stir in 2 ounces of cheddar cheese, then sprinkle the remaining cheddar on top. Broil for 2-3 minutes or until cheese has melted (keep a close eye on it while broiling). 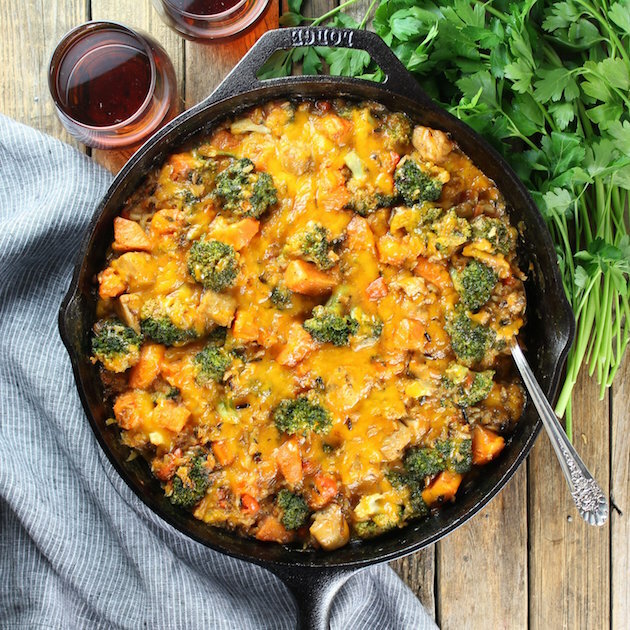 Chicken Skillet with Sweet Potatoes and Wild Rice - A hearty, comforting one-pan meal loaded with broccoli, sweet potatoes, wild rice, and chicken! See full recipe at Taste and See.